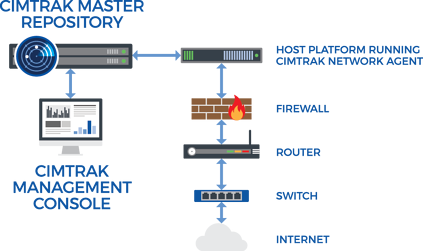 CimTrak for Network Devices protects against unauthorized or accidental changes to your network infrastructure to keep your IT systems secure, avoid costly downtime and ensure maximum availability of vital network resources. Eliminating unexpected outages requires knowledge of what’s actually changing and mitigating those events in real-time. CimTrak provides complete visibility into your entire network for monitoring, troubleshooting, and proactive management. This includes detecting and blocking attempts at unauthorized access, providing configurable alerts to network administrators, recording actionable reports about intrusions and taking quick, corrective action to return your network back to its normal state. You cannot afford system outages and bottlenecks that affect productivity and business continuity. CimTrak ensures maximum up-time of your network devices guaranteeing that your employees aren’t blocked from essential applications, files, and data they need to do their jobs effectively.